On 26 October 2017, Ms. Sigrid Kaag assumed her new position as Minister for Foreign Trade and Development Cooperation of the Netherlands. In this context, Ms. Kaag had to step down as a GCSC Commissioner. Ms. Sigrid Kaag was appointed Under Secretary-General and the Special Coordinator for Lebanon by the UN Secretary-General in December 2014. Prior to that she served as Under Secretary-General and Special Coordinator of the United Nations – Office for the Prohibition of Chemical Weapons (UN-OPCW) Joint Mission to eliminate the declared chemical weapons programme of the Syrian Arab Republic. 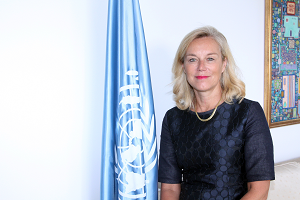 Ms. Kaag has gathered a wealth of experience in the political, humanitarian and development affairs during her career in Middle East, Geneva and New York. Ms. Kaag served as Assistant Secretary-General with the United Nations Development Programme (UNDP) and as Regional Director for the Middle East and North Africa with the United Nations Children’s Fund (UNICEF) for several years. In addition, Ms. Kaag obtained extensive experience on refugee and migration issues serving with the International Organization for Migration (IOM), and the United Nations Relief and Works Agency for Palestine Refugees in the Near East (UNWRA). Before joining the United Nations, she served with the Dutch Ministry of Foreign Affairs and Shell International. Ms. Kaag was awarded with the Carnegie Wateler Peace Prize in November 2016. She holds a Master of Philosophy in International Relations from Oxford University, and a Master in Middle East studies from Exeter University. Ms. Kaag was awarded an honorary degree in Law by Exeter University in 2014. Ms. Kaag is fluent in Dutch, English, French and German, and proficient in Arabic and Spanish. She is married with four children.